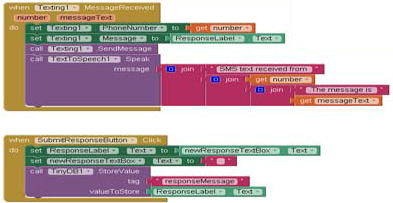 I am trying to create the No Texting While Driving app in Chapter 4 of the AppInventor2 book and am having a problem. In the Text to speech portion, it shows using a JOIN block to string together a phrase and the phone number and a phrase and what the actual message is. However, in the text drawer where the JOIN block is, there is no JOIN block with four plug in slots, just two. I have joined a couple of JOIN blocks together (picture below) will this work or am I just missing something? See that fancy blue square on the JOIN boxes? Click on that. 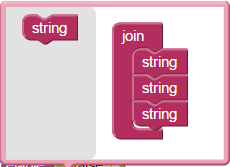 Then drag the "STRING" block from the left of that menu into the JOIN block on the right of that menu.